Why Management practice is not practical? Practice is a practice that is different from theory. Many of us argue that learning concepts are distinct from its application during practice. In this blog, I will discuss three arguments of practice discussed by academics, industry leaders and my own observation. An academic will define coordination, and integration would be as good management practice for a manager. It does not matter how many hours an employee work. What is important – how a manager is integrating the unique abilities of its employees to achieve the goal. In fact, the success of a manager depends upon how he/she turns people talent into performance. In Physics, a force is called work when there is a displacement of the point of application in the direction of the force. Jack Welch (CEO, GE) believed to be a gatekeeper in transmitting the ideas to his managers by choosing right people, rightly compensated and channelizing their energy to implement the idea. In fact, when I returned after completing my PhD from University of Edinburgh, I found that practice requires impractical people. I argue that a short term thinking believes in practical management while a long-term approach leads to a sound management practice. Good management practice is not possible until senior management reward creativity by rightly compensating managers and establish an open and proactive culture. Contrary to this, a new word for practical is unethical. In large organisations, rules and policies are set by the board of directors. This led managers to reject those projects which fall out of the scope of company’s policies. A practical manager will manipulate the language and may accept all the projects. He may show higher sales in short run and receive the bonus. In long-term also, that manager will gain as the consequences of accepting the projects will be faced by his/her successors. Very soon, rules will remain in paper and manipulation of language in a contract will become management practice. Competitors will also follow and may make it as the industry norm. If everybody is making some mistakes, it is nobody’s mistake. P-O-L-C framework of management supports managers to respond to the challenge of creative problem solving. Is something missing in this framework. I observed that management practice in general substantially differ from practical management. Ethics and risk management are important for managers. Ethics support in the decision making of what is right and what is wrong while risk management guides on the consequences. Surprisingly, both are not included in management curriculum at many places considering them as not practical. Planning, organizing, leading and controlling in normal market situation is easy however, it is very challenging in turbulent markets. We need reformist, leaders, veterans who can think, act and implement good management practices. I asked them that these doctors and lawyers are professionals from a long time, what’s new about it. They were pointing out the wrong definition of professionalism. From professionalism, they mean ‘unethical’. In this situation, everyone bears the losses due to some short-cuts are taken by others. Management as a practice will not survive until we don’t avoid unethical decision making under the umbrella of being ‘practical’. 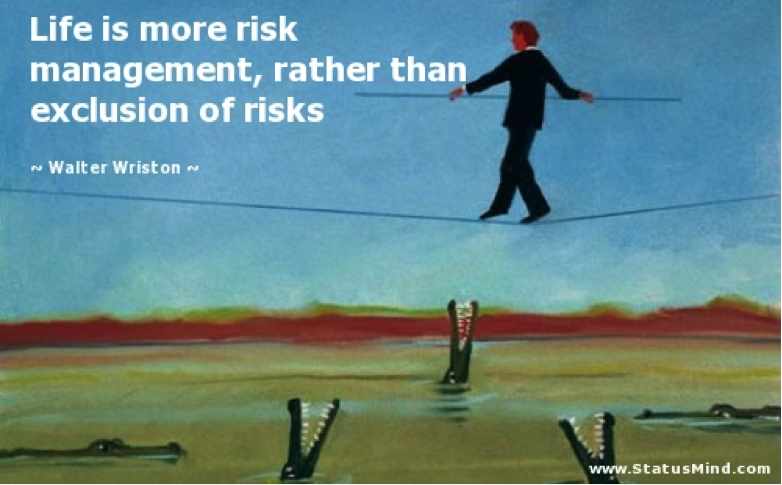 Why Understanding of Risk Management is Important for Managers? Understanding of risk is complex which scare people to develop its understanding. Michael Power, Professor of London School of Economics (LSE), has brought attention to different boundaries of risk management from ‘Risk Management of nothing’ to ‘Risk Management of Everything’. This can be interpreted: one cannot totally avoid the risk management and cannot claim to include all existing risk. Inclusion and exclusion of risk depends upon the understanding of risk itself within management. In this blog, first I will discuss what a manager is supposed to do and why he/she faces dilemmas in management of risks. Then how those dilemmas can be tackled through better understanding of risk management. A manager does not supposed to do all work by himself/herself rather he/she engage in planning, organising, directing and controlling. The management major role is to enhance motivation of the team to deliver work in timely and effective manner with agreed quality to achieve organisational objectives. Several questions arise when management process actually followed during practice at grassroot level. How to organise work so that it can get complete on time with agreed quality without operational errors? If I pass on the information to my colleagues, how I will make sure it is understood same and performed in the same manner as directed? There is a likely chances of realizing a gap between the expectation set and the actual results? How to control the risk to achieve organisational objectives? Management knowledge of risk should not only confined to resolving dilemmas but also to enhance strategies. A better planning, organising, directing and controlling can only be achieved if management understand their own risks. For example, if a company would like to construct a building and have experience of 5 years. The company recorded its own risks for example 100 risks related to construction in particular geography and use industry risk data. This company can better estimate the risk from a new company in the market having no experience of handling construction risks. All companies face operational errors whether they are large or small. Understanding of the operational risks can make safety systems more profound and robust to deal with possible errors. It is observed that corrections of errors do not pose much issues rather repetition of errors make blunders and cause failures. The understanding of risks also support managers to grow in their career path. Board of the director, CEO of the company has to deal with risks at strategic level which have higher impact though, general management has to face only day to day risks. Expectation of understanding of risk from an agent of the company and director would be substantially different. Risk Management is an important part of Management at all level and cannot be separated. Don’t, get frighten from risk just learn to deal with it, the benefits will follow you. Enter your email address to follow FinGuru and receive notifications of new posts by email.